This tutorial covers the basic steps to create and paint an image in Paint Shop Pro that can be stamped onto a 3d model using PowerStamper. In this tutorial we will use Jasc Paint Shop Pro to paint an image that will be used to stamp the eyelashes into the material bitmap of a head model. Open the file BigHead.max and Render the Camera viewport. 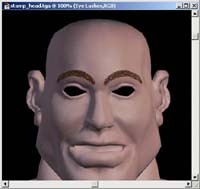 The file has a head model, with a Skin material and a single UVW Channel. The UVW channel was created using Unwrap UVW to unwrap a spherical mapping channel and export it to a new UVW Frame, and using Edit Mesh, Relax and Push modifier the exported UVW Mesh was flattened and organized. Select the BigHead object, go to the Utilities panel and click the More button. Select PowerStamper from the list. The first thing we need to do is to set the stamping image filename and size. This file will be rendered and saved by PowerStamper, and is the same image we will modify in PhotoShop to add details. Click the Stamping Image button and set the name as stamp_head.tga. In the Set Stamping Image Size set the size to 800 � 600. Now, click the Render button below the Stamping Image button. A new image is rendered and saved to the filename you set above. Create a new layer. This layer is where we will paint the eyelashes. We paint on a new layer because in a later step we will use this layer's transparency to create the alpha channel that will be used to stamp only the eyelashes. Using your PhotoShop skills paint a couple of eyelashes in the eyebrows. Go to the Layers Palette and turn off the Layer Visibility of the Background layer (the head). With the new layer as the current layer, go to Masks > New > From Image and create the new Mask from the image opacity (this is why we turned off the visibility of the background, which was 100% opaque). Go to Mask > Save to Alpha Channel and click OK to save the alpha channel. It is very important that you end up only with one alpha channel, so remove all channels that are not the eyelashes selection. The last step is to remove the background, so any of the rendered skin colors will be stamped into the final skin detail bitmaps. To do so, turn on the visibility of the background layer and fill it with a black color. Finally, save the head_stamp.tga image as a 32 bits bitmap. You can use Save Copy As... or Merge All (Flatten) the layer and save the image. Go to 3d studio max and with the ViewFile utility check out that the stamp_head.tga image is the one you just modified in photoshop. Since all the masking will be done by the stamping image alpha channel, we don't need to smoothly attenuate the stamping image using the surface normals, we just need to make sure that the eyelashes are stamped in the front, and not in the back of the head. Make sure that Premultiplied Alpha is unchecked since we are stamping using a black background image with alpha masked details. Click the Output Bitmaps button, and in the dialog box, click the Set Output Bitmap and set the name to head_mat.tga. Set the size of the bitmap to 800 � 600. Leave the MatID and the UVW as 1. 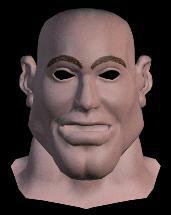 In the Skin Material, diffuse channel, create a new Bitmap Map and set the bitmap to head_mat.tga. Render the scene using the 3d studio max Render button. Unlike 3D Painting applications, in 3d studio max you can modify the mesh for every stamping process to better expose the zones that you will paint.